We implore your majesty most humbly, O Lord, that, as the feast of our salvation draws ever closer, so we may press forward all the more eagerly towards the worthy celebration of the Paschal Mystery. Through our Lord Jesus Christ, your Son, who lives and reigns with you in the unity of the Holy Spirit, one God, for ever and ever. According to the 1962 Missal of Bl. John XXIII the Extraordinary Form of the Roman Rite, today is the feast of St. Louise de Marillac. She was born in 1592, and married in 1613. When her husband died she made a vow of widowhood and devoted herself entirely to works of charity. St. Vincent de Paul, who became her spiritual director, gradually initiated her into his own charitable works for the poor and afflicted, and in 1639 they founded the Congregation of the Daughters of Charity to which St. Louise dedicated the rest of her life. She was canonized by Pope Pius XI on March 11, 1934. St. Louise de Marrillac married an official of the royal court, Antony Le Gras, and after his death in 1625 was an active supporter of the charitable work of St Vincent de Paul, who came to put more and more reliance on her. Mademoiselle Le Gras, as she was known, became the co-founder with him of the Daughters of Charity, whose 'convent is the sick-room, their chapel the parish church, their cloister the city streets'; it was she who drew up the first draft of their rule of life. Her clear intelligence and wide sympathy played a big part in the beginnings of the congregation, whose aspirants she trained and whose rapid growth involved responsibilities which largely fell on her. At the time of her death there were already over forty houses of the sisters in France, the sick poor were looked after at home in twenty-six Parisian parishes, hundreds of women were given shelter, and there were other undertakings as well. St Louise was not physically robust, but she had great powers of endurance, and her selfless devotion was a source of incalculable help and encouragement to Monsieur Vincent. — Dictionary of Saints by Donald Attwater. Patron: Disappointing children, widows, loss of parents, sick people, social workers, Vincentian Service Corps, people rejected by religious orders. Symbols: Saint Louise is depicted wearing the original Vincentian habit of grey wool with a large headdress of white linen (typical of poor women in 17th century Brittany), perhaps with an infant in her arms. Teach your children this simple morning aspiration by St. Louise: "Grant me the grace to spend this day without offending You and without failing my neighbor." Begin planning a family Passion presentation or play in which all can participate. You may want to plan this for the end of Lent — Spy Wednesday or Holy Thursday would be particularly appropriate days for this. 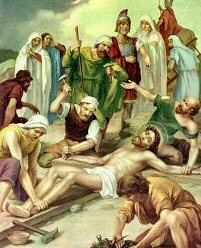 St. Longinus was the Roman centurion who pierced the side of Christ with a lance. He is said to have converted to Christianity after experiencing the darkness after Christ's death. 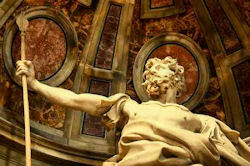 Read more about the statue of St. Longinus at St. Peter's Basilica. Read The Life of Saint Longinus from the Golden Legend. Today's station is at the Church of the Twelve Apostles. Traditionally, this is the place where the Romans choose their candidates for priesthood (Rite of Election). It was erected by Julius I (337-352) over the barracks of ancient Rome's firemen and entrusted since 1463 to the Conventual Franciscans. Originally dedicated to the Apostles St. James and St. Philip, it was rededicated to all the Apostles in the 16th century.